China’s chances of halting bird flu are dwindling, the United Nations warned on Saturday, as the deadly virus extended its reach across Asia and sped towards Thailand’s southern tourist hot spots. “We have repeatedly said there is a brief window of opportunity to act within China,” World Health Organisation specialist Julie Hall said after Beijing confirmed new outbreaks in the provinces of Hubei and Hunan were the lethal H5N1 strain of avian influenza. “This latest news strongly suggests that the window is getting smaller with each passing day,” she said. Controlling outbreaks in China — expected to produce some 10.1 million tonnes of poultry in 2004 — is particularly worrisome for health experts because nearly four out of five chickens, ducks and other fowl are raised on household farms, where peasants live in close proximity with their animals. Humans are only believed to be able to catch the virus from birds, not each other, but experts fear it could mutate and become infectious among people. From all I can see, China is doing as good a job as possible to retain transparency and to nip this brewing crisis in the bud. The sheer size of the country, however, makes this an awesome challenge. Conrad is upset with John Kerry for saying that the threat of terrorism has been exaggerated by our leaders. But couldn’t it be possible that Kerry has a valid point? Obviously terrorism is a horrendous danger. But how much money (and angst) should we be spending on it? And how many rights should we sacrifice to make the world safer from terrorism? The Bush mentality seems to be “whatever it takes.” This siege mentality allows us to spend literally unimaginable amounts of money fighting our War on Terror. Don’t we have a right to question what the return on investment is? And considering the billions and billions being spent, is it that strange that some of us feel the threat, dire and awful as it is, has indeed been exaggerated, especially in regard to life’s many other threats? This was driven home to me today after I read an absolutely superb article on whether 911’s costs in terms of freedoms sacrificed and money spent are matched by the actual threat at hand. This piece, which I found via an obscure blogger, is definitely a must-read. It manages to take a complex and ultra-loaded subject and get the reader to look at it from a new perspective. Security is a trade-off. It makes no sense to ask whether a particular security system is effective or not–otherwise you’d all be wearing bulletproof vests and staying immured in your home. The proper question to ask is whether the trade-off is worth it. Is the level of security gained worth the costs, whether in money, in liberties, in privacy or in convenience? Rarely do we discuss how little identification has to do with security, and how broad surveillance of everyone doesn’t really prevent terrorism. Unfortunately, it’s rare to hear this level of informed debate. Few people remind us how minor the terrorist threat really is. Rarely do we discuss how little identification has to do with security, and how broad surveillance of everyone doesn’t really prevent terrorism. And where’s the debate about what’s more important: the freedoms and liberties that have made America great or some temporary security? Instead, the Department of Justice, fueled by a strong police mentality inside the administration, is directing our nation’s political changes in response to Sept. 11. And it’s making trade-offs from its own subjective perspective–trade-offs that benefit it even if they are to the detriment of others. The writer is Bruce Schneir, an author and expert on security issues. I admire his ability to drive home points that we’re not hearing enough about. It’s quite staggering: there is no ceiling, no spending limit when it comes to protecting us against terrorism (fast becoming a nearly indefinable mess of a word). Are we truly getting a level of protection that matches the vast expense? Are the tradeoffs in terms of freedoms and tax dollars expended justified? This is wrong. The trade-offs are larger than the FBI or the Justice Department. Just as a company would never put a single department in charge of its own budget, someone above the narrow perspective of the Justice Department needs to be balancing the country’s needs and making decisions about these security trade-offs. The laws limiting police power were put in place to protect us from police abuse. Privacy protects us from threats by government, corporations and individuals. And the greatest strength of our nation comes from our freedoms, our openness, our liberties and our system of justice. Ben Franklin once said: “Those who would give up essential liberty for temporary safety deserve neither liberty nor safety.” Since the events of Sept. 11 Americans have squandered an enormous amount of liberty, and we didn’t even get any temporary safety in return. Yes, maybe the threat of terrorism has been exaggerated. It is not unpatriotic to suggest as much. We have to approach it as rational people, and not give Bush and Ashcroft carte blanche to spend however much on it they see fit, and to erode essential freedom in the name of the T word. Just as with trips to Mars and the moon, we should and must ask, is it worth it, or is the need an exaggerated one? Wuer Kaixi , a Tiananmen protestor who fled China for Taiwan in 1989, has some powerful things to say about Chirac’s cozying up to the Chinese last week, and especially his reprimand of Taiwan. It may be one of the most eloquent appeals I’ve ever read. I and others who managed to escape [the Tiananmen Square crackdown] were given refuge, and for a brief period the international community paused and reappraised its relationship with a regime that was prepared to put down a peaceful people’s movement with troops and tanks. Where has that reappraisal brought us? Sadly, it seems nowhere. Since the Tiananmen bloodshed, we have seen a parade of foreign leaders and multinational corporations feting China’s leaders, as if somehow things have changed for the better. Nothing has changed. If anything, China’s leaders have learned their lesson, and have a tighter grip on power today than they did then. And doubters need only look to Taiwan, and recently also to Hong Kong – where on Jan. 1, 500,000 people took to the streets for greater democratic freedoms. Realpolitik demands that we be practical on the Taiwan issue; but it should also demand that we not delude ourselves about China. In 1989, Beijing chose military action over open dialogue with a peaceful people’s movement; today it tells us that a popular vote in Taiwan risks invasion. I fear now, when I see the leaders of the United States and France reprimanding Taiwan, that the ideals that those countries were founded on, that my countrymen shed blood for in Tiananmen, and that Taiwan now challenges with a popular vote, have become disposable. Naïvely, I had hoped for better of France, which has become the latest in a roll call of democracies – the United States included – that appear ready to abandon Taiwan’s right to democratic freedoms if that is how Beijing says it must be. Yes, very naive, unfortunately. The West just has too much riding on China to risk insulting its leaders. I’m no great supporter of Chen and his antics. But I do think it’s fair to say Taiwan has been doublecrossed. I can understand the acute disappointment, especially from one who fled China in 1989 and knows only too well what it’s capable of. This is for hard-core media/political junkies only, and if you don’t follow the US elections and how the media cover them, this will be meaningless. If you are, like me, moderately obsessed with US policitcs and are amazed that James Taranto seems to have free reign to ridicule all Democratic candidates at a level that lies somewhere between the disgusting and the illegal immoral, this site is worth a visit. What the blogger here is saying (though not quite in these words) is that Taranto’s jokes are not jokes at all. When Taranto always refers to Kerry as the “haughty French-looking senator who, by the way, served in Vietnam,” it becomes a meme, a little word group that gets stuck in readers’ minds. It becomes for many the Truth. Just like his always referring to Krugman as “the former Enron adviser.” It’s a clever, wicked technique. I’ve written about Taranto before and won’t bore you with a rehash. Suffice it to say I find him the single most odious political commentator out there. The big danger is that he is very, very smart, and he knows exactly what he’s doing. And what he’s doing is downright immoral. I report on a dumb story of a rotting whale explosion in Taiwan and it looks like I may get more visitors than on any other single day since SARS. Of course, traffic can be very fickle, and it tends to disappear as quickly as it arrives…. In response to request for a bigger photo of the sickening mess, here you go. Click to enlarge the picture. Yes, that is the entire whale carcass on the tractor trailer in the background. As one commenter asked, why didn’t they enshroud the thing in plastic wrap before moving it through the city? 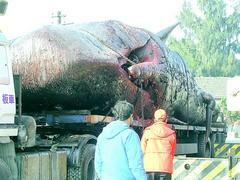 Here’s the whale carcass prior to — I think — its decision to disembowel itself on the busy Taiwan street. Update: Well it was fun for about 15 hours. Traffic now drifting back to normal…. A long and detailed article in the latest Time Asia takes a look at a number of talented young radicals in China (including Chun Shu, author of bestselling novel Beijing Doll) who turned their backs on the conventional, went off to do their own thing and achieved fabulous success. These are true rebels — dropouts complete with body piercings and up-the-system clothes and unhidden contempt for the status quo. Their story is fascinating, showing just how far it is possible to go in today’s China. But the overriding message is that, yes, there are freedoms and opportunities in China today that only a few years ago would have been utterly unthinkable — but that still, there is a definite line in the sand that these rebels know they must not cross. It’s easy, then, to understand why the control-obsessed Party isn’t terrified of linglei, why labor camps aren’t filled with cliques of neon-hued punk wannabes or herds of dropout Bill Gates types. Superficially, China’s linglei are suitably outré: the piercings, the leather jackets, the defiant dropout pose affected even by nerdy kids like IT entrepreneur Wu. Even so, reading about what these people have accomplished at such tender ages and within such a confining system — it’s quite beyond belief. When I was in high school, I would read that poem over and over again, slowly (it has to be read slowly), dwelling on every syllable, marvelling at the alliteration and Tennyson’s ability to paint such a vivid scene with so few words. “The wrinkled sea….” Amazing. 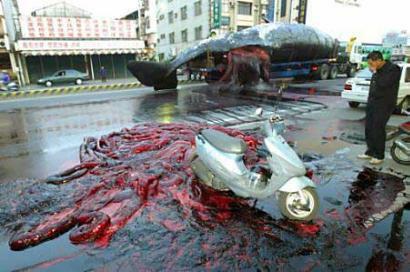 Here’s a photo, in case you were wondering what it looks like when a sperm whale explodes on a Taiwanese street. Healthy chicken at a poultry farm in Longan county, Guangxi, being vaccinated by a medical worker. The paragraph was widely interpreted to mean the Chinese authorities were behind another cover-up after the Sars debacle last year. But the New Scientist correspondent who wrote the article said in e-mail replies yesterday that it was a ‘misunderstanding’ and that she ‘did not accuse China of covering up the presence of the virus’. ‘On the contrary – I noted that because of the widespread vaccination of chickens, if they have the virus circulating they would not necessarily even know it because there would be no major bird deaths as we have seen elsewhere,’ Brussels correspondent Debora Mackenzie said. ‘The only point of raising these issues was not to try and blame China for something, but to suggest that it would be good, for the reasons I outlined, to know more about the circulation of H5 viruses in China,’ she said. So maybe the jury is still out on this one. I think we have to give China the benefit of the doubt until we know more. China is now the 10th nation in Asia to confirm the presence of Bird flu, and is now banning poultry exports from the south-western Guangxi region and the central provinces of Hubei and Hunan. At least 83,000 poultry in the three provinces have been killed, and officials estimated another 110,000 would be culled. Xinhua said the situation in all three regions was ‘under control’. Across the region, the H5N1 strain of the bird flu virus has claimed 10 lives in Vietnam and Thailand. The Chinese commerce ministry also said yesterday it had suspended imports of poultry from Indonesia, Laos and Pakistan in a bid to curb the spread of bird flu, Xinhua reported. The move, announced by the commerce ministry and said to be effective since Wednesday, brings to eight the number of countries hit by a Chinese import ban. The others on the list are South Korea, Japan, Vietnam, Cambodia and Thailand.